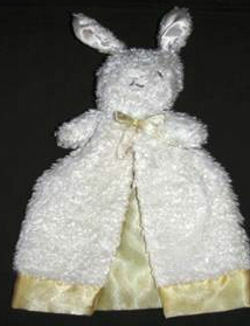 I desperately need the white with yellow lining Gerber bunny blanket. My daughter just lost hers at Great America recently, and she has had it before she was even born. We are all devastated and still praying they find it. But my pessimistic side tells me I need to try to find a backup. She’s almost five and only the same bunny will work as a replacement for her. I greatly appreciate any help or information anyone can give me regarding this bunny. Ebay WHITE & YELLOW Item No. 180683380168 – I’m afraid it is very expensive – US$114.99. 🙁 Also available Item No. 270793751265 in WHITE & PINK but this one is cheaper. Had you thought of just changing the ribbon and satin lining to yellow on one of the other colours? Thanks, Brenda. I notified the mailing list. Thanks! That’s a much more reasonable price, so maybe someone will get this one. Thank you for all your help. I’m going to check this latest one out now. Maybe it’ll be the right one and affordable. Thanks, Carrie. It’s been a month since I sent an email to the mailing list with a notice that I would discontinue the search if I didn’t hear from them, so this list is now finished.